The Netherlands Arbitration Institute (NAI) is the most prestigious institute in the Netherlands for the arbitration of commercial disputes. While NAI arbitration is the dispute resolution mechanism of choice of many Dutch corporations and public entities, it is increasingly agreed on by foreign parties selecting the Netherlands as a neutral venue for their potential disputes. 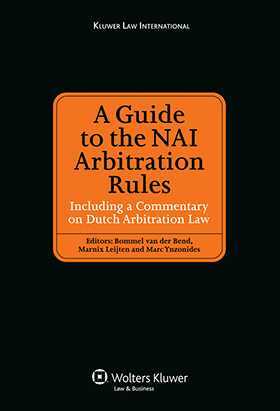 This excellent volume, a rule-by-rule guide to the NAI Arbitration Rules, is not only the first such handbook in English, but the most comprehensive and detailed in any language. In addition, it provides a unique commentary in English on important elements of Dutch arbitration law. the arbitral award, including the possibility of rectifying , supplementing and setting aside this award. The provision-by-provision analysis also compares the NAI Rules with both relevant proceedings in the Dutch state courts and, inter alia, ICC and UNCITRAL Arbitration Rules and to practice under such other rules. The authors of this matchless book have faced many questions on the NAI Arbitration Rules, advised on the interpretation and correct application of those Rules, and defended such interpretation before tribunals and courts. In this book they share their experience, insights, and expertise. Counsel for corporate clients and public entities contemplating arbitration proceedings – as well as counsel to parties in NAI proceedings or related court proceedings – will find here an incomparable guide to the NAI system and Dutch arbitration law. Foreword. Part I: General Introduction. 1. General Introduction to the NAI Rules. 2. Arbitration in The Netherlands. Part II: A Commentary to the NAI. Section 1 – General Provisions. Section 2 – Commencement of Arbitration. Section 3 – Appointment of Arbitrators. Section 4 – Procedure. Section 4A – Summary Arbitral Proceedings. Section 5 – Award. Section 6 – Costs. Section 7 – Final Provisions. Part III: Post Arbitration Court Proceedings.